The Riedel Sommeliers wine glass line is the top-of-the-line series of stemware from the legendary Riedel. Wine experts agree that glassware makes a profound difference on how wines taste. Riedel Sommeliers wine glasses are the benchmark and the most successful series of hand-made glasses in the world. The creme de la creme of luxury stems. The Riedel Sommeliers wine glass line is the top-of-the-line series of stemware from the legendary Riedel. Wine experts agree that glassware makes a profound difference on how wines taste. Riedel Sommeliers wine glasses are the benchmark and the most successful series of hand-made glasses in the world. The wine glass bowls are mouth-blown into a mould, the stem and base are handcrafted using ancient glass-making methods.Recommend to hand wash. The Riedel Sommeliers Sauternes / Dessert wine glass is designed to emphasize acidity of sweet wines, thus balancing the wine's sweetness and luscious finish. The unusual curved design accentuates the apricot aromas typical of wines made from grapes affected by botrytis ('noble rot'). 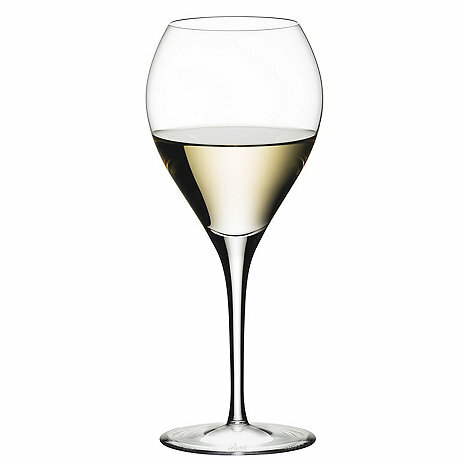 Experts from around the world have hailed this wine glass to be ideal for Sauternes and sweet wines. Recommended for: Auslese, Beerenauslese, Trockenbeerenauslese, Eiswein, Sauternes, Tokaji. Is this glass appropriate for red dessert wines? BEST ANSWER: I would think so, if concentration of the nose is a key enjoyment factor for you. These are great for Sauternes... it's like putting your head inside a fishbowl with a rim that then directs properly on the tongue. Outstanding glasses. Can I have names engraved on these glasses? BEST ANSWER: Please call our customer service department at 800.648.6058 and they can assist you with this. For corporate gifts, please call our sales department at 800.356.8466. Thank you. Can it be used for a port served with berry cheesecake as a dessert? The only possible downside (other than price) of these beauties is that they are very delicate. This purchase was to replace a glass that literally burst into dust! Of course I dropped it on a tile floor. Otherwise a perfect dessert wine glass. Enhances the nose and delivers the wine precisely onto the tongue. Absolutely delighted with these glasses. A must-have for Sauternes lovers. Although I have friends that do not believe that a wine glass can make a difference in the taste of wine, I have been using Riedel glasses for ten years and I am a convert. These sauterne glasses are magnificent. They make even the moderate priced dessert wine more enjoyable.